Enjoy 10% savings with this proven combination of supplements designed to clear acne from the inside out — while delivering vital nutrients for overall wellness. This 3 in 1 Supplement is an extremely powerful trio for both inflammatory and non-inflammatory acne. Contains therapeutic levels of Vitamin A to treat acneic skin. This one-of-kind nutraceutical provides a natural alternative to acne medications such as Accutane which can have potent activity but may have significant side-effects. To increase the absorption of the Healthy Skin Formula and for increased acne clearing, it is highly recommended to pair it with the Vitamedica Omega3 Fish Oil supplement. Vitamin A– an antioxidant and anti-inflammatory. It prevents the sticky build-up of cells that would otherwise clog pores and is essential for the normal shedding of the cells that line the follicle (pore) wall. A minimum of 10,000 IU’s of Vitamin A are recommended daily for treating acne. Do not use therapeutic doses if pregnant or trying to become pregnant. Zinc– an essential mineral and anti-inflammatory. It is responsible for releasing Vitamin A from the liver and also assists in metabolizing Omega-3’s. In addition, zinc helps to clear away Substance P, a nerve chemical that promotes sebum production. 40-50 mg daily are recommended for treating inflammatory acne. Selenium– is a mineral that works with and preserves levels of other antioxidants. Research has found low levels of selenium in acne patients. Great for inflamed acne patients with or without associated GI problems (ie. gas, bloating, constipation and other digestive problems). Diet and lifestyle are often to blame for acne breakouts as well as digestive issues. Unfortunately, antibiotics kill both good and bad intestinal flora and frequently upset digestive balance. Probiotics with Lactobacillus and Bifidobacterium, specifically, will quickly re-establish good flora in the system to eradicate acne and digestive problems. Extensive research has been on the Lactobacillus strands and it’s tremendous acne clearing benefits. 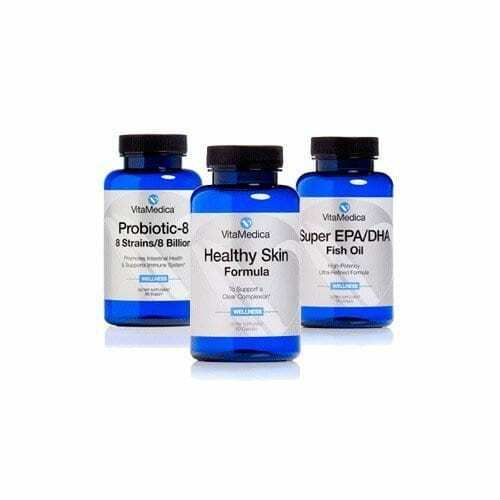 VitaMedica’s broad spectrum probiotic for acne supplement is formulated with 8 different species of Lactobacillus and Bifidobacterium beneficial bacteria to naturally replenish your system. Each 8 billion serving of live beneficial bacteria decreases inflammation and acne as well as promotes GI regularity. A unique addition to this supplement is the prebiotic FOS which assists in the healthy growth of beneficial organisms.